Our infamous Black Tuesday is an imperial stout aged in bourbon barrels for over a year. Rich caramel, toasted malt, vanilla, burnt wood and anise are just a few of the many flavors in this rich, decadent imperial stout. From: The Bruery in Placentia, Calif.
To say that I was excited to have this was the understatement of the century. 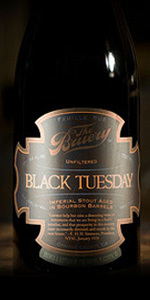 I can’t think of a beer I’ve wanted to try more than Black Tuesday. A big thanks to Chris for letting me buy one of his bottles. This is going to be good. If Stouts could inspire liqueur, then this beer is the epitome of that discussion. Again, The Bruery outdoes themselves with another transcendent ale. Beers simply don't get bigger, bolder, more confident or... more ideal! Its highly viscous pour is the blackest of blacks- its onyx-like sheen makes the beer look every bit as much like an oil slick as it would anything meant to be placed in the mouth. Ominously dark, mysterious and undoubtedly masculine- there's simply something menacing about the beer's appearance. With really no foam, froth, or streaming to mention- the beer's espresso-like character takes hold. As espresso is where the aromas take off. Deep sweet and smoky roast character is charged with the strongest roasted coffee that's woven together with molasses and maple syrups. Dark chocolate and dried fruit gives the beer a complex wine-like nose. Cherries, grapes, dates, figs and oak peak through the enormity of malt along with hints of coconut, vanilla and caramel as the beer warms. Heading into taste, the stout's low-lying carbonation allows its massive malt sweetness to latch onto the taste buds and saturate them fully with high espresso roast, black-strap molasses, bittersweet chocolates, walnuts and a savory, smoky sweetness. Port wine and aged sherry release savory and almost salty flavors with a certain "meatiness" that reminds me playfully of teriyaki and soy sauce. Its that sweet and salty interplay that creates such a savory combination that the stout easily replaces dessert as after dinner reward. Its molasses-infused bourbon flavor is well equipped with oak, vanilla, coconut and char as the beer warms. Incredibly rich and chewy, the beer's viscosity wraps around the tongue like a ribbon of silk- it might as well make love to the mouth. Its heavy coat easily penetrates to soft tissues of the mouth and is slow to release- allowing for a forever linger of sweetness, booze and brownie. With all the Imperial Stouts on the market, few reach this kind of apex- its every much a digestive liqueur that's as well balanced, complete and robust as any. If stout is the questions, then Black Tuesday wins! Pours an oily, not completely black color with brown-red hints in it, with a small bubbly mohagony head, collapsing to a small lacing. The beer reveals thick alcohol legs after swirling, coating up the edges of the glass. Offers an intense nose, consisting of scorched cocoa nibs, molasses and an intense warmth, resulting from the Bourbon barrel. Bourbon blends perfectly into sweeter, dark and full bodied aromas, revealing dried earth and walnut shell, topped off by a note of cinnamon and wooden vanilla. Very intriguing and well balanced, promising a huge, warming beer. Drinks surprisingly easy, don't get me wrong, you can tell this is a big beer, but its Bourbon characteristic is amazingly well integrated into the beers overall taste. Drinks expectedly smooth, with a silk, full-bodied mouthfeel, featuring a long lasting warmth, while the taste evolves throughout, challenging the tastebuds in a pleasant way. Tastes almost instantly of Bourbon, while its presence in the beer is that fundamental, that it only lends wooden oak initially to a foundation of burned rock sugar, wrapped up in a huge amount of earth and bakers chocolate. Develops a spicy, burning but pleasant bite, being far away fom numbing the palate, together with a present oakiness. Cocoa nibs develop more presence, as do vanilla beans, accompanied by a dry, warming Bourbon burn. Bourbon doesn't want to leave the palate at all, while milk chocolate and a note of creamy caramel join in, countering the wooden dryness perfectly. Ends with a long lasting glow, wandering down the throat, accompanied by chocolate, oak and a note of cinnamon. A unique experience without a doubt. We zipped on this all night, and it took me more than a glass to adjust to the huge body of the beer. After that, it has been a real pleasure to drink it, while I can not confirm that this beer has a relatively thin mouthfeel, which is what I read before more than often. It exhibits a strinking depth and complexity, centered all around well entangled Bourbon, which always saves enough room on the palate for other flavors to unfold. I have yet to have a single beer from The Bruery that I felt had warranted any of the hype that the beer and brewery had generated, and Black Tuesday really was no different. It falls into the same vein of so many other barrel aged stouts in that it has that similar coca-cola taste that far too many brewers shoot for. The body is too thin, the taste is overly sweet, the heat picks up in an unsettling manner as it warms, the smell is cloying instead of engaging, and I've already explained the taste. Please, folks, don't judge this on the difficulty you had getting a bottle, or the hype that everyone else spouts. Instead, take a step back and compare it to other BA stouts. It isn't special, and it doesn't distinguish itself when you set it with other world-class offerings. Thankfully I did not pay or trade for this, but unfortunately a friend of mine did. Neither of us will make the mistake of looking for this again. Good lord this is a beast of a beer. A- Not super impressive. Typical high ABV stout; little to no head. Basically pitch black, but not the darkest I've seen. S- GOOD GOD. The aroma on this thing is incredible. This was done side-by-side with BCBS, which smelled simple and boring compared to this thing (and I'm a BCBS fanboy). Sweet vanilla, charred oak, bourbon, licorice. Unbelievable. T- I was worried that the taste wouldn't live up to the aroma, but there is no worries here. Wave after wave of dark fruits, chocolate, sweet vanilla, and bourbon. This is not a beer that will "sneak up on you." This beer lets you know its going to dominate you from the beginning. M- Typical high ABV stout. Pours thick, though nothing like TenFIDY. Low carbonation. Sticky as hell, but smooth. Foams well when swished in the mouth. O- Need I say more? Best BBA Stout I've ever had hands down. This thing is a monster, so it may not be for everyone, but if you are looking for something to blow you away, this'll do it. Opened a bottle today that I obtained direct from brewery last Dec. It has been stored at 36F most of the time. I had a taste of another bottle in December, and it immediately reminded me of BCBS, but with some difference in character. It had a more pronounced dark fruit flavor. After 8 months of cold storage, I finally tried my bottle, and it immediately grabbed me with its strong, mellow flavors, and its similarity to BCBS. I now find it better than BCBS, as it seems to have stronger flavors. Beautiful dark, sweet flavors of raisins and plums, along with strong bourbon and barrel flavors, plus a good dose of alcohol. Label says it "contains alcohol". No kidding. Tastes very much of alcohol, perhaps too much for some people, but I like it in small amounts. Takes 3 days of dedicated effort to finish a bottle. I'm about half way through this one after 2 days. Seems to last quite well with fridge storage after opening, no doubt due to high ABV. There is little carbonation to begin with, and no perceptible change in flavor profile after a couple days of bottle being opened. Really tremendous stuff, and I'll have to see about getting some more. I feel like such a homer and a feeder of the hype-machine by giving this beer such an amazing review, but I cannot help it. It deserves it. A: Black Tuesday is jet black and has one of the best heads I've seen. A finger or so of mocha colored foam that has incredible staying power. If it didn't taste so good, it would be great to just look at it in the glass. S: As one might expect from a beer as big and bold as this, there are great aromas of bourbon, chocolate, roasted malt, vanilla, sugar, and surprisingly mild alcohol. T: The flavor is strikingly similar to the aroma (no shock there). The huge chocolate and bourbon barrel flavors are the first to knock your socks off. As you continue to enjoy the beer, you pick up on some dark fruits and licorice, along with some sweeter flavors of vanilla and brown sugar. Eventually the alcohol burn starts to creep in as the beer warms. M: The carbonation on this beer is low, but the bubbles help to keep it from being too heavy and overwhelming. I find it to be a great match for the flavors and the enormous body of Black Tuesday. D: Well, this could do well to sit in a cellar for about 5 years. But, it's still so wonderful now that I would not turn a serving down. This is one beer that truly has lived up to its hype (for me, anyway) and I look forward to sharing my bottles and my friends bottles whenever we feel so moved. An absolutely world class beverage! 2014 version, opened for the birth of my son Nathan. 2011 vintage opened at Joe & Julie's place. Served in a badass Batman Forever stein, back when McDonald's actually had cool giveaway items. A - A nice finger of tan foam settles to a thick collar but minimal lacework. Black body with a glint of brown at the edges of the glass. Pretty impressive at 18.2%. S - Huge bourbon barrel presence, with plenty of dry wood, whiskey, vanilla, and dark chocolate. Only mild roast and coffee flavors in the periphery. Intensely rich, with well-hidden alcohol - most people who tried this would have never guessed it was over 18%. T - Taste is quite similar, with massive amounts of chocolate, vanilla, and lighter touch of bourbon, barrel, and caramel. Again, there's minimal roast character, resulting in this being very sweet. Still it was quite easy to drink and never became cloying. M - Viscous and shake-like full body, with enough carbonation to get things from getting too heavy or sludge-like. Some alcohol warmth, but nothing untoward. Pretty creamy, with only mild barrel tannin presence. I expected a slightly heavier beer at 18.2%, but I appreciate that this drinks like it has an ABV in the low teens. D - Really enjoyable stuff - the 2011 seems to be developing nicely as I thought it was a bit boozy last time I had it just before Christmas. I know there's been backlash against the hype on this beer, but it's really excellent and among the Bruery's best offerings. Just make sure you have friends on hand, as drinking more than 6oz will put you in the fast lane to incomprehensibility. 2013 vintage. Pours pitch black with no head and little to no lacing. Lots of bourbon, dark fruit, and tobacco. Caramel, chocolate, fig, anise, bourbon, and dark roast coffee on the palate. Some alcohol burn. Full bodied with little carbonation. Overall this beer is a monster best sipped. Quite delicious. Black Tuesday pours, well, black, with a thin and wispy beige head that recedes to a faint ring around the edge of the glass. Thick, vinous legs on this one, too. The aromas are intense: heavy, heavy alcohol presence that's a lot like straight bourbon (though the alcohol aroma settled substantially as the beer warmed up); dark red fruit like raisins and cherries; chocolate; and a very nice oaky vanilla. Flavors are a dream: sweet, booze-drenched chocolate; spicy alcohol heat; caramelized brown sugar; vanilla marshmallows; more vanilla and molasses; more of those dark red fruits; and a faint char or roastiness on the finish. There's almost a sherry- or port-like flavor to Black Tuesday, which transforms this beer into one fit not only for mortals, but also for the gods. Mouthfeel is not thin, but not as viscous as I was expecting. It's just smooth, substantial, and exactly right for what's going on with the flavors. There's definitely a bit of alcohol burn, but this seemed to dissipate as the beer warmed up. Overall, Black Tuesday is one of the best straight BA stouts I've ever had, maybe slightly ahead of BCBS and slightly behind the king of the roost, Parabola. The flavors are rich, complex, and hard to capture adequately with words. If you're a BA stout fan, you'll love this one. Bottle poured into snifter. Reviewing a 2013 bottle on 10/24/14. A: Pours dark black with less than a finger of khaki head. The head is very thin and reduces very quickly to practically no collar. S: Strong aroma of bourbon, chocolate, coffee, molasses, and a fairly pungent alcohol burn. In the back I get dark fruits, vanilla, and roast. Needless to say there's a lot going on here. The heat is not a surprise, but still worth mentioning. T: The chocolate and bourbon are what I get as the boldest flavors. Fading in the background are vanilla, coffee, molasses, and roasted malts. At 18.9%, I expected something complex and bold, and this delivers. Very enjoyable, and as a bourbon fan, I have to say this bring the bourbon notes along very well. M: Moderately low carb level, but high enough to keep from calling it syrupy. Leaves a very sweet after taste that helps cover up the heat. O: This is a delicious beer, one that I'd recommend to any craft beer nerd who is also into bourbon ( which is almost every craft beer nerd I know). Lots of heat going on as expected, but the aroma and flavor pack the punch to make this an all around enjoyable beer. Was gifted a 2013 bottle by @Evilash to celebrate the birth of my son. Ended up opening it on the day my son came home from the hospital, which also happened to be my birthday. Drank over the course of 3 hours at cellar temp. This is the new gold standard for BA stouts for me personally. It is very strong, as the abv suggests, but there is a sweetness behind it that brings it into balance. If I'm lucky enough to grab another bottle at some point, I will split it with someone- I was dragging the next day! I'm a bit disappointed in the merely dark brown body and dinky head (hey, it's 20%). I'm not disappointed in the port-like aroma. Subtle undertones of nuanced bourbon (think vanilla, banana, marshmallow, and even coconut) coexist with intense dark fruit qualities. It's a great nose, though it doesn't quite floor me the way I expected. The flavor profile indeed reveals many similarities to port. It opens with incredible tones of fig, raisin, currant, apricot, cherry, plum, and peach. Around the middle is where the bourbon flavors appear. It ends with a powerful (but complex) malt sweetness, some umami, and an also significant alcohol presence. Though the booze is somewhat harsh, it also creates layers of nuance that help compensate for the insane sweetness. Somewhat. The palate is coated with a ton of residual sugar, and that makes it a SLOOOW sipper. Even a tiring one. I have even more qualms about the somewhat thin and firm feel - it's not well suited to the flavor profile. Still, the zesty carbonation IS suited to the aforementioned thin, firm texture, helping to cleanse the palate ever-so-slightly. I really dig many aspects of this, and it's one of the most complex brews I've ever sampled...but I doubt I could even drink half a bottle. It's just way too sweet, boozy, and over the top at the end of the day. I doubt I'd trade for this again, but I'm happy to have finally tried it. Enjoyed a 2010 at Darkness Days this year. Pours a black, toasted marshmallow head- amazing laces in the glass. The aroma is pure bourbon. It is incredible how the bourbon aroma held up. Dark Chocolate, Toffee, Caramel, and Blackberry also present in the nose. Taste reveals a medium-body stout. Matches the nose perfect- bourbon forward, with nice dessert hints as it warms. NO WAY is this 20% ABV. Hides it perfect. I think that BT is great fresh, or with 2-5 years of ago- something we happens during that ~1 year mark- but before and after that it is sublime. If you can snag this vintage, do. Amazing beer. You can't drink the bottle alone. Extremely smooth and hides the incredible high abv unbelievably well. Brandy and bourbon and refined oh my. Burns but not badly. Refined drinking that will annihilate you. Pour at a tasting. Dark thick black body. Big Sweet aroma. Wow, huge big sweet chocolate taste. Tastes like a chocolate covered caramel. So good. After warming up a bit though, that big 19.2% alcohol burn starts to be noticeable. 2013 bottle poured into a FW Teku on 7/4/14. Happy birthday America! A: Dark black with ruby highlight when held up to the light. Not as pitch black as I expected. Small tan head recedes to nothing after about 30 seconds, per usual for a BA beer with this high of an ABV. S: HUGE milk chocolate, caramel, and boozy bourbon notes. Hints of dark fruits and a slight alcohol burn close things out. Just a massive nose, the usual BA stout characteristics turned up to 11. T: Syrupy sweet caramel and vanilla upfront. Pleasantly boozy bourbon and toasted raw cacao notes from the malt followed by a note of raisins. Extremely complex, but bordering on too sweet. Surprisingly limited alcohol character. M: Thick and syrupy with low carbonation. Ridiculously mouth coating viscosity only adds to the decadence. O: A ridiculously flavorful BA stout. Unbelievably pungent in every sensory aspect, but somehow manages to stay relatively balanced. Every bottle is a treat. Black Tuesday...what a name. Enjoyed as part of a tasting of BT, GM, MW, and CR. A-Few beers will ever look as deadly. A brief glance at the label and you'll know (at 19.7%) this isn't something to take lightly. This beer doesn't have a color, it's strictly the absence of all light. S-Huge alcohol up front, almost as if smelling a spirit. Bourbon is slightly there, but is overpowered by the alcohol content of the beer itself. T-Husky up front. Lost of malt in here. Hard to pick out a dominant flavor. The bourbon/malt/alcohol is very complex. F-Lots of alcohol means this one is a sipper. Was lucky to share in a '12 bottle. Poured a pitch Dar k even in a 5oz tulip & didn't allow any light through. Bourbon jumps up & out. Followed by chocolate, slight vanilla & burnt sugar. Some much flavor depth, but get dark chocolate, bourbon, and sugary sweetness. Fantastic beer overall. The epitome of what a barrel aged stout should be. All I can really say is.... wow. This was a magical elixir for me... I cracked a 2014 bottle at a bible study; was amazed by the smell and struck by the incredible bourbon booziness. Looked at the bottle more closely and realized it was 19.7%. Simply a wonderful sipping beer. The bourbon smell and flavor is just incredible with a heavy chewy mouthfeel. There is a sweet syrupy chocolate undertone to this beer and the aftertaste just keeps going. This may be called Black Tuesday but I will fondly remember this as Blackout Sunday. I personally appreciate strong flavors and this one is no joke. Shockingly good. Get your hands on this one, you won't be disappointed. First off, huge thanks to Derek (@2beerdogs) for the chance to sample this gem. His beer karma is much appreciated. Aroma: Big raisin and plum notes abound. Low woody notes and strong bourbon character up front. No hop aroma. Big dark fruit and licorice notes abound. I love the well knit character of the dark fruit aromas, licorice, and woody notes. The smell hugs my nose like a warm blanket. Appearance: Inky black pour with a moderate-low tan head. The head retention is good. Flavor: More dark fruit with a big sugary molasses character. Low woody notes as in the nose with a background bitterness and slight roast character to provide a counterpoint. Hints of vanilla emerge as it warms. The finish is clean and dry. The balance is definitely malty with wonderfully knit flavors and amazing depth. The aftertaste is lingering and slightly woody. Mouthfeel: Medium-full bodied with medium-low carbonation. Silky on the tongue with a tinge of alcohol heat. Overall impression: While still exhibiting the character of a wood-aged Imperial Stout it also reminds me of a well-aged English Barleywine. There is depth to this beer that shows different layers each time you sample it. Truly an amazing feat. This is the best barrel-aged beer I've had. A treat worthy of all the hype. Final beer of the short-notice share with Justin and Morgan in FL. 750 ml bottle poured into red solo cups. Jet black body with tan head that slowly fades to a film. Legs but no lacing. Aroma of chocolate, bourbon, oak, roast malt, coconut, marshmallow, and dark fruits. Flavor is moderately sweet with cocoa, brown sugar, and plum notes, but also decently bitter with barrel, booze, and unsweetened chocolate highlights. Full body, oily, thick texture that coats the tongue, minimal carbonation, sweet, boozy hot finish. 750ml bottle from 2012, about 6oz poured into a snifter at Dustin's birthday tasting yesterday, 6.15.2013. Aroma: Lots of bourbon and heat, which dominates the nose. But there are marshmallows and tons of chocolate, very sweet. It basically smelled like bourbon smores. Interesting! I thought the heat was really off-putting, but altogether this beer has a really, sweet and complex nose. Colour: Pitch black, like a black hole. Not much of a head at all, which is not surprising for a high gravity beer like this. There isn't even a collar, and there isn't any lacing at all when I swirl it around. Its black, that's all I can expect from a beer called Black Tuesday. Flavour: Really, really sweet. Like mentioned before, it tastes like a crap ton of chocolate, bourbon and a little vanilla sweetness. There's a lot going on here, but the best way to put it is hot, hot bourbon smores. It all comes together well, not all that cloying. Deliciously bourbony and malty! Mouthfeel: Thinner bodied but full of flavour. Actually quite well carbonated for a giant stout like this. Aftertaste is mostly all the malty sweetness that I experienced while swishing this beer along my palate. Its pretty much dessert. Really, the biggest problem with this beer is that it's so damn boozy. I know its a 19.2% beer, but it was just a beer that took a long time to finish. Still, so black and thick... gotta say this is a hell of a mouthfeel. Overall: Delicious. It's like drinking bourbon and port together. Thick thick beer that is very sweet but not cloyingly so. As mentioned above, the problem is that its got too much alcohol in it- I can smell it in the nose immediately as its being poured, and it definitely gets hotter as it gets warmer. I think its a deliciously sweet barrel-aged big stout but for the $36 it costs per bottle, I'll take 6 bottles of BCBS. It's not a very good value IMO (which does not detract from the overall scoring in this review), but I'm glad to have at least tried it.